There’s a saying in Japan that you’re born Shinto, get married as a Christian, and die a Buddhist. In other words, you practice Shinto rites from birth, have a Western-style wedding, and leave this world through Buddhist funeral ceremonies. Thus, one of the many unique aspects of Japanese culture I experienced growing up there was seeing station wagons with tiny, shiny golden Buddhist temples sprouting from their backs. 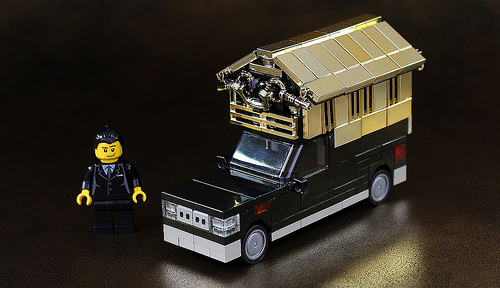 These little mobile temples are actually Japanese hearses, and Moko has once again used his collection of chrome-gold bricks by building a LEGO version of this iconic Japanese vehicle. In case you’re too dazzled to notice, I’ll also point you to the clever front grill on this 4-wide LEGO car. 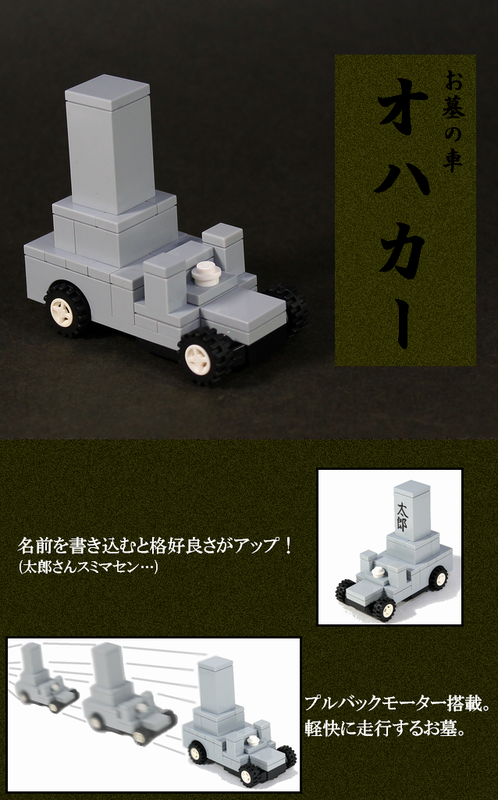 Check out Moko’s blog for more photos, including breakdowns and building techniques. And for all our bilingual readers out there, here’s a totally ridiculous vehicle. Unfortunately, that’s the best I can do, since the very silly pun in Japanese (「オハカー」) simply does not translate. The car has a pullback motor, though I suspect a crash could result in grave consequences. That pun is so funny I need to go lie down now and meditate on my life. Memento mori.